Any time I talk to someone about running a marathon and I receive the response, “Man, I could never run that much. You’re crazy!” my first thought is, “You probably could–you just don’t feel like you have a reason to run that distance.” Of course, this doesn’t apply to every person, but I must admit that I was initially unable to run a single mile…and even I eventually crossed the finish line of a full marathon! What reasons did I have? What motivated me to take on this (at times) seemingly unattainable goal? Well, I had honestly never even considered running a marathon. It seemed so unlikely and far-fetched that I equated its probability to that of having stretchy powers like the mom on The Incredibles. 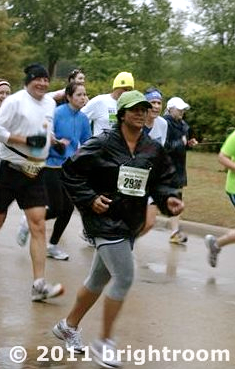 The seed was planted in my head when one of my best friends, Monica, completed her first full marathon in 2010. Having someone so close to me accomplish such an incredible feat inspired me and motivated me to explore my own boundaries. My body/health had already been through so much at this point, that I was ready to regain control over my body (sickness, begone!) and find a unique way to push myself to my limits. I thought that training for a marathon would be the perfect opportunity to rediscover my own strength. I had also lost a lot of confidence in myself since school and health had not been working in my favor. I was in desperate need of setting a goal and actually realizing it. Whenever I mentioned my potential goal to Monica, she was beyond encouraging (to say the very least). Even though I knew how hard she had worked to achieve her goal (just kidding, I had no idea at the time–you never know how hard someone works to train unless you’ve done it yourself), she made me feel like I was capable of working just as hard and pushing myself just as much. She actually probably knew I would cross that finish line long before I did. I’ll save the emotions that I went through while training and running the actual race for a later day, but know that it was quite possibly the most emotional experience of my life. No, not possibly–from start to finish, it was the most emotional experience of my life. I will never forget how I felt on May 1st, 2011. To the date, one year after running the full marathon, I was in the hospital after having surgery on my legs. It took four nurses, my mom, and a boatload of pain to help get me out of bed (after which it was decided that I wasn’t ready to be out of bed for another week). I want to say that it made me feel determined to fight and run in the future, but that would be a lie. My mom can attest to how defeated I felt that day. All I could think about was how badly my body had deteriorated in a year’s time. I couldn’t even relate to that stranger of a girl who had run 26.2 miles exactly a year earlier. Now, 6 months later, I can finally say that I have found that person within me again. I’m strong, determined, and I have one hell of a support system. And that’s why I can say with full confidence that I’m going to run another marathon on April 13th, 2013. After that? I’ll keep running. Because I can. This entry was posted in Anecdotes, Running and tagged 26.2, discouragement, health, marathon, perseverance, running. Bookmark the permalink. I’m so blessed to have such encouraging and supportive friends like you. Couldn’t have done any of this without you! 🙂 I will be rooting for you! Thank you : ) I’ll need all the encouragement I can get! You inspire me every day! I’ve done 1 half and plan to do my second half at the OKC Marathon in April. I still don’t know about the full, but I know that without a doubt, you’ll be successful in your 2nd Marathon!!! Oh friend. Thank you so much for your kind words. Good luck on your second half in April–I KNOW you can do it! Let me know how it goes!! Beautifully written!! I’ll be rooting too!! Thank you so much : ) and thank you for reading! !